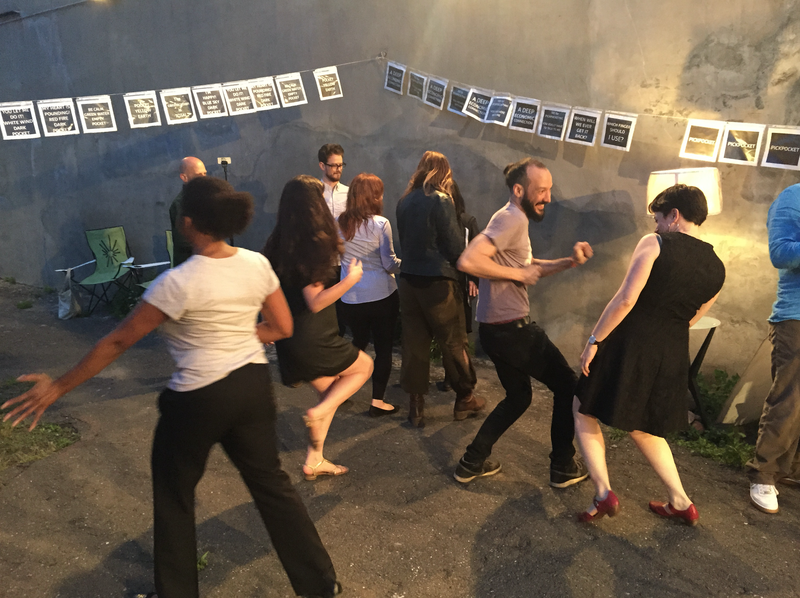 PICKPOCKET is an intimate dance performance and DJ party (2 Pickpocket Parties in 2015 at 1067 PacificPeople). PICKPOCKET plays with the power of intimacy, physicality and presence between the performers and the party guests. It invites everyone to become a body of outlaw by joining the Pickpocket Academy; a pickpocket tutorial in a unique energetic non-yoga yoga style to generate the possibility for something new. It questions our relationship to power, money, intimacy, pleasure and desire. This experimental live-performance is conceived by artist/choreographer Andrea Haenggi with the artist team Carrie Ahern and Robert Neuwirth. The party unfolds around one-to-one performances, meaning each visitor experiences each performance on their own. Gradually it moves into dancing for everyone to the spinning industrial jungle beats by DJ Darryl Hell. The female performers Andrea Haenggi and Carrie Ahern want you become a pickpocket. So a tutorial crash course in the art of picking a pocket delivered in dulcet yoga instructor style transforms the party into a participatory social experiment. What happens if everyone senses his or her outlaw body and the evening becomes a “stealing” dance party? Are we all victims now? Are we in a culture of fear? How do we deal with possession? Quick. Alive. Hands that slide. Hands that alight. Hands that steal. Out of necessity? Or an appetite of danger? The Art of a Team. The Art of Destruction. The Art of Compassion. The Art of Attention. A Social Experiment. A Dance. Do you want me to call the police? In PICKPOCKET PARTY the hand and its different gestures, which stem from various quoted sources, plays the central role. Each performers links to a choreography of hands, which places the everyday treatment of money and exchange of goods carried out by our hands in the center and creates choreographic moments out of the “outlaw” gesture “pickpocket”. Sources of inspiration are such as Robert Bresson’s movie Pickpocket, Yvonne Rainer’s film Hand Movie and our own personal desire to sensitize our hands to re-connect with the other to find the social commentary what are we taking from each other.